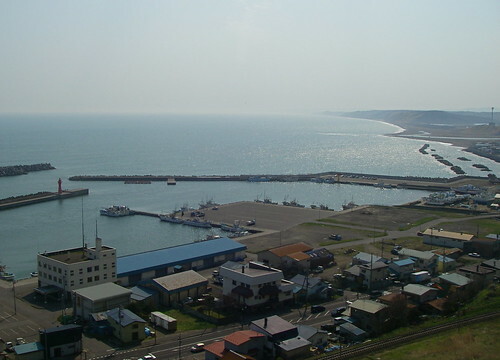 My last day in Kushiro started at Washo Ichiba, the city's famed market. Seafood is the main draw, attracting both locals and tourists, the latter wandering the market with bowls of rice in hand, the better to sample the wares with. We did the tourist thing, of course, but first we had a good look around the market. Beautiful whole salmon were everywhere. The ones shown here were priced between 6000 and 10,000 yen, although I saw a giant one going for 36,000 yen. 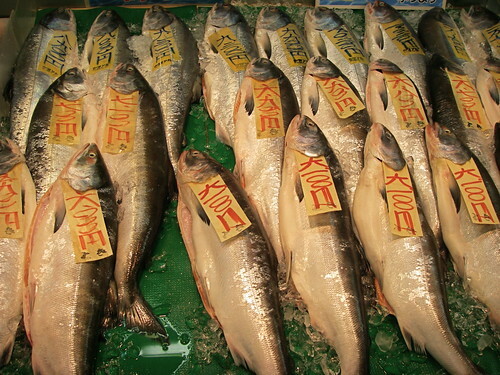 All were caught wild, either in Hokkaido or Russia. 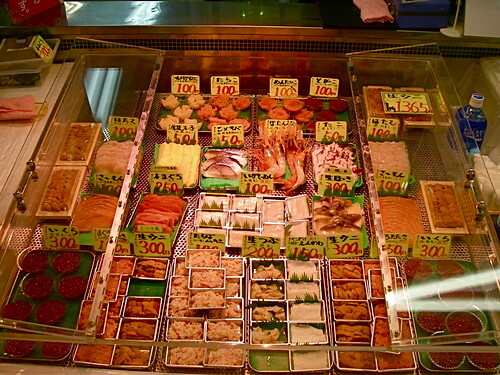 Some merchants specialized in one type of seafood, while others had a little bit of everything. The scallops above were lovely and if I had access to a kitchen I would have bought them (I bet they'd be wonderful sauteed in Hokkaido butter). Crab was almost as plentiful as salmon, and I imagine there would be even more of them in the winter when they are in season. 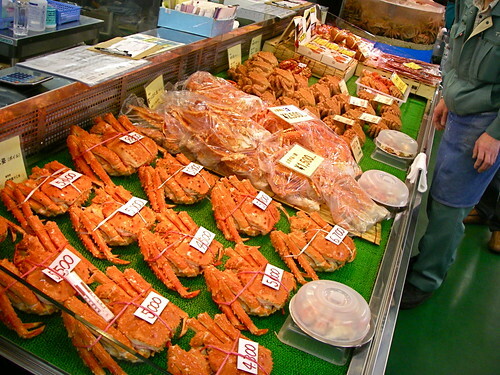 In the foreground above are whole tarabagani (king crab) going for 4300 to 9800 yen, in the background are bags of tarabagani legs for 1500 and 2500 yen, and in the background are whole kegani (hairy crabs), priced at about 3000 to 5000 yen each. There were also a mind-boggling array of shellfish. 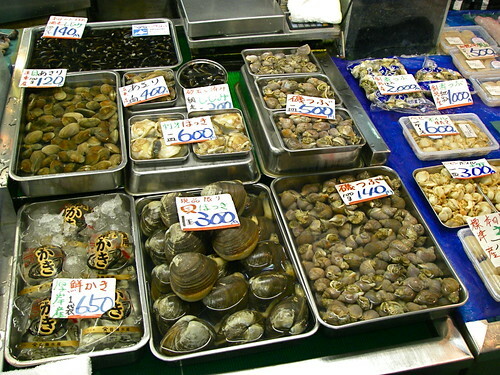 Above, from front left are bags of shucked oysters at 650 yen each, giant hokki-gai clams for 300 yen apiece, and iso-tsubu (a variety of tsubu-gai, or whelks) at 140 yen per 100 grams. 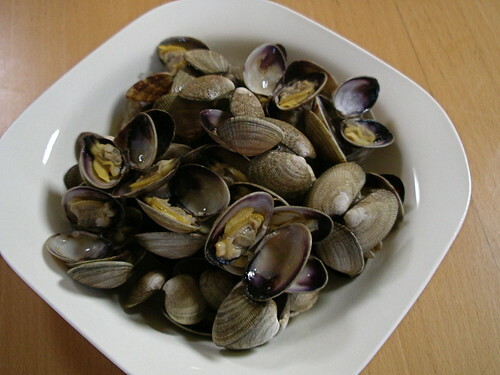 The row behind that has asari (littleneck clams) for 120 yen per 100 grams, a small tray of asari for 400 yen, a tray of shijimi clams for 300 yen, trays of shelled hokkigai for 600 yen, and trays of iso-tsubu for 500 yen. 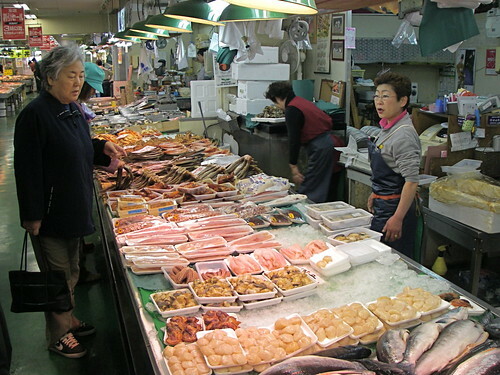 Behind that row are shijimi for 140 yen per 100 grams, and to the right are bags of shelled and cooked tsubugai and trays of shelled and cooked scallops, with roe and frill still attached. 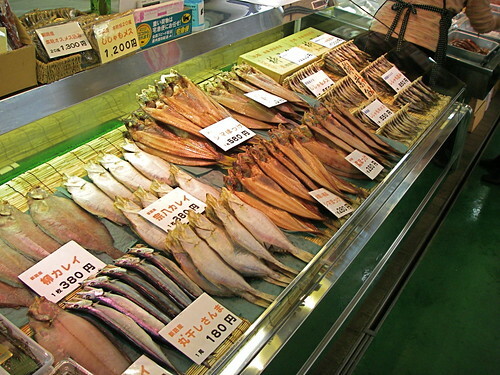 This shop carries himono (partly dried fish). 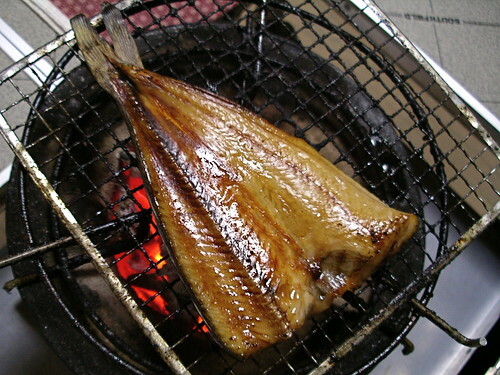 The whole flatfish are karei (flounder), the whole fish in the foreground are sanma (Pacific saury), the split fish are hokke (atka mackerel), and the small fish on sticks in the background are shishamo (smelt). Getting into more unusual stuff, on the left we have sujiko (salmon roe sacs), much smaller than the usual size. I've never seen them so small but I suppose that's the size they are this time of year (spawning not occurring until autumn). Or maybe they just came from midget salmon. 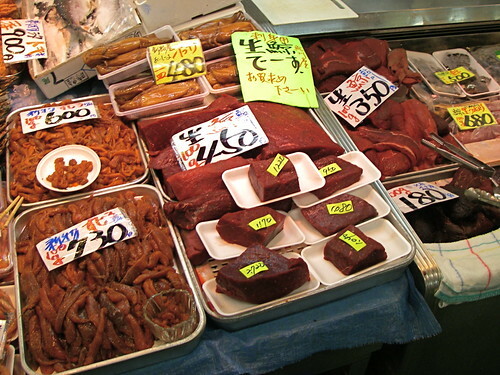 Those big chunks of meat are fresh whale, priced at 180 to 450 yen per 100 grams. I'm not sure what the difference in price is for: different species, different cuts, or different levels of freshness? 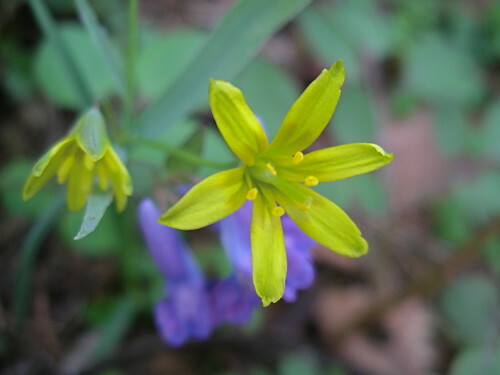 As is the norm in Japan, the species is not identified. 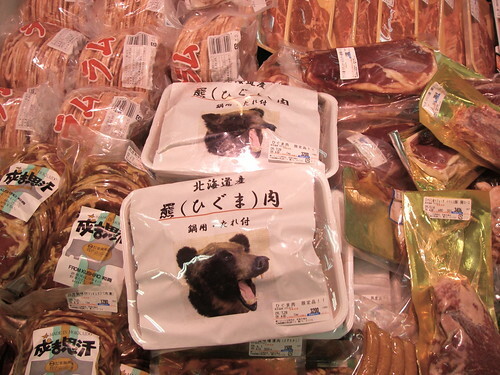 One of the few non-seafood merchants had variety of local and imported meat: lamb from Hokkaido, iberico pork from Spain, and local higuma (Japanese brown bear), packaged in a not very appetizing way. And having seen the sights, it was time to do the tourist thing and have kattedon, which is a donburi (bowl of rice) topped with whatever little bits of seafood you fancy. 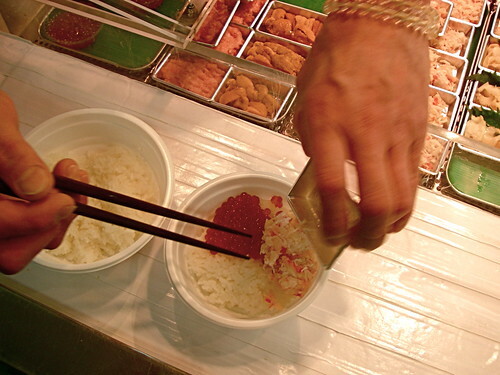 It's a brilliant concept, as I've often find myself walking around a market and accepting samples here and there, thinking those samples would be so much better with a bowl of rice to enjoy them with. Unfortunately the free samples aren't forthcoming once you've got your bowl of rice, and the merchants sell tiny amounts of their wares for kattedon-toting tourists. You can end up paying a lot, but it's still a neat idea. The done thing is to buy a styrofoam bowl of rice (priced from about 100 to 300 yen depending on the size) and wander around the market, buying toppings here and there. We were in a bit of a rush so ended up buying everything at the place above, which had everything we wanted and more. 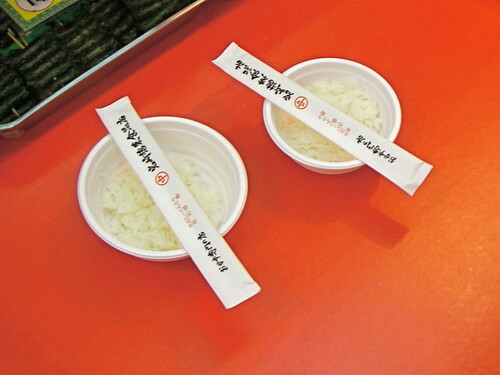 The seafood was packaged in single servings, and the merchant simply grabbed each little container as we chose it and emptied it onto the rice. Once we'd finished choosing it was all topped off with soy sauce and the price was calculated. We ended up paying just under 1000 yen each, including rice, which is by no means a bargain but not bad considering the quality of the ingredients. And as a bonus, the merchant slipped an extra slice of tuna onto my kattedon, so I'm not complaining. 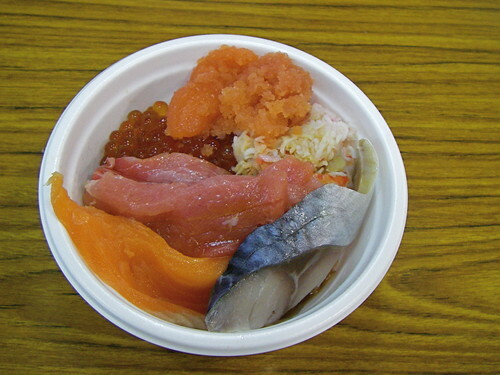 My kattedon consisted of, from bottom, salmon, tuna (not local but it looked good), ikura (salmon roe), tarako (pollack roe), crab meat, and saba (mackerel). It was very, very good, although the crab was a little too doused with soy sauce to fully enjoy it. 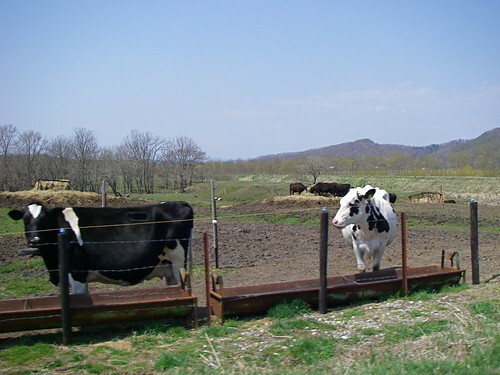 With breakfast over with, we drove west into the countryside to visit a farm. Like almost everywhere else we'd been so far, there were cows all over the place, but it wasn't a dairy farm we were headed to. We went to Hitsuji Marugoto Kenkyusho, a sheep farm run by Shogo Sakai, an acquaintance of my brother-in-law. 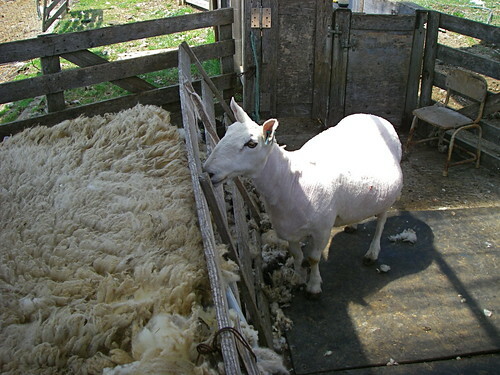 We came during a sheepshearing session and got to watch the ewe above get a very complete haircut. She was pregnant and didn't put up much of a fight, at least not the way I've seen the few times I saw sheepshearing on TV. 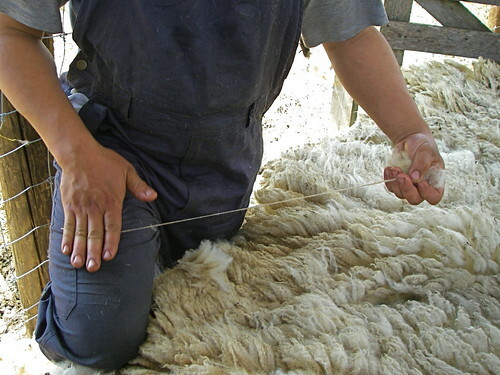 Of course Mr. Sakai was quite a bit more gentle than those sheepshearers, and managed to relieve the ewe of her wool while leaving barely a scratch. 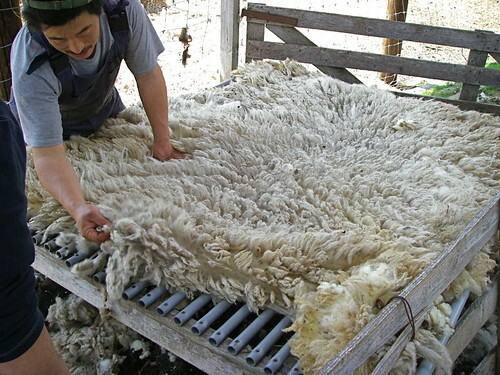 Her wool came off in one big piece, and was placed on a rack to be graded and have any debris picked off, a job usually performed by Mrs. Sakai. 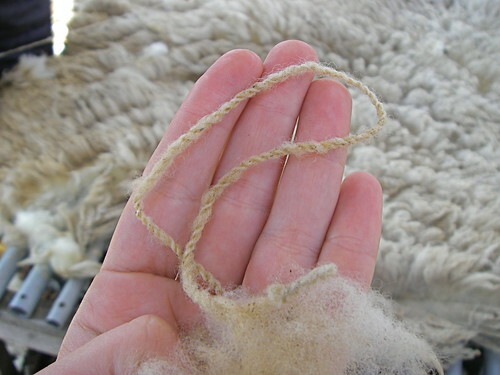 He picked off a small tuft of wool and deftly spun it into yarn the old-fashioned way. It was amazingly strong and soft. 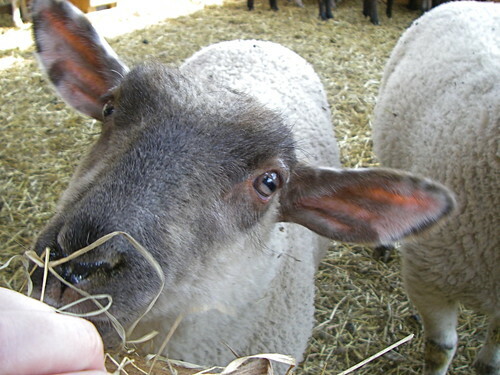 Meanwhile, the ewe showed some mild interest in her former coat, but didn't seem to upset at loosing it. 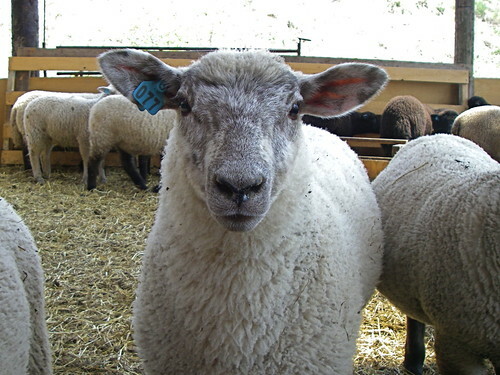 Next we visited a barnfull of lambs born last year. I think a good number of these are destined for the dinner table. And then we got a look at the sheepskins. 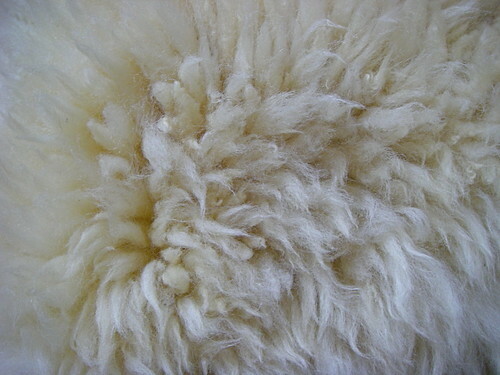 Called muton (from the French mouton) in Japanese, they looked so soft and inviting that I couldn't help but dive in to the pile. They felt just as nice as they looked, and Hideaki's brother ended up buying three of them for us: the soft cream coloured and short black ones shown above and a curlier, fuzzier cream-coloured one. I'm sitting on that one right now, and wow is it ever comfortable. 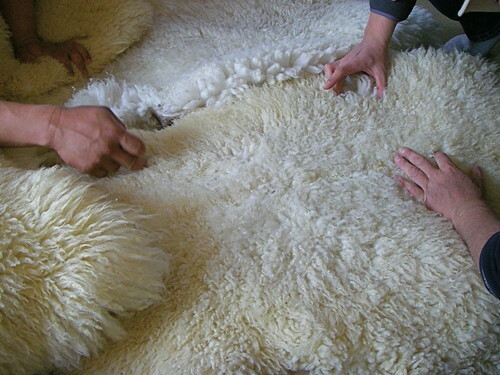 If I could I'd cover all my chairs and sofa in sheepskin, cover the floor in sheepskin rugs, and have my sheets made of sheepskin too. It's wonderful stuff. I can even understand the Uggs craze a little. Next we hit a cheese factory, which as luck would have it was holding a small festival. 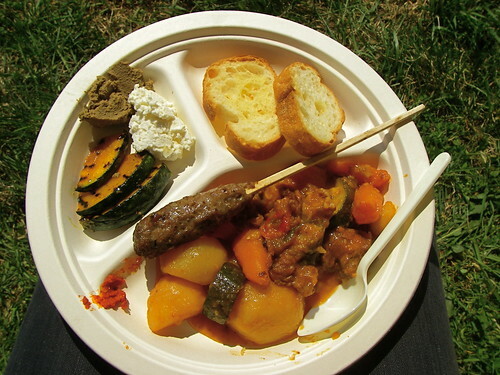 It was a perfect time for lunch, so we had a lovely meal of lamb stew, grilled kabocha squash, pate, cottage cheese and bread, and a just-grilled lamb kabob. 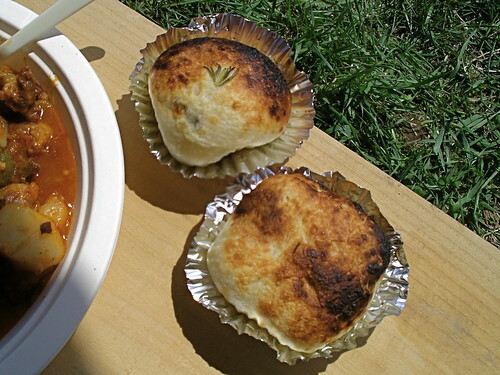 And to go with it, cheese-filled buns baked in an improvised brick oven. Eaten under the warm spring sun, this was a lovely, lamby lunch. 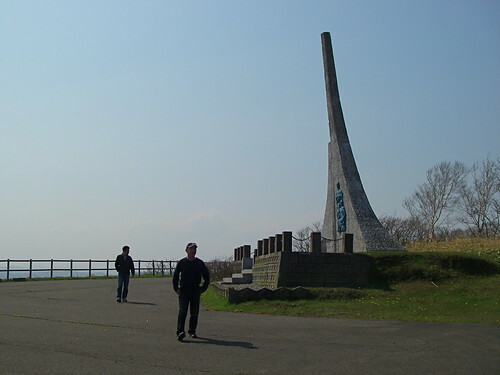 We drove back to Kushiro along the coast, stopping at a lookout point for a view of the ocean. 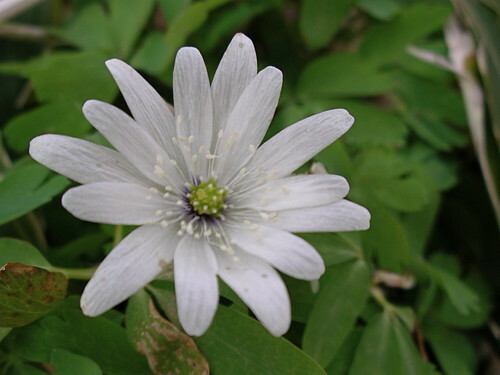 There were more wildflowers up there, like this kikuzaki-ichige (Anemone pseudoaltaica), and the kibana amana (yellow star-of-Bethlehem) below. 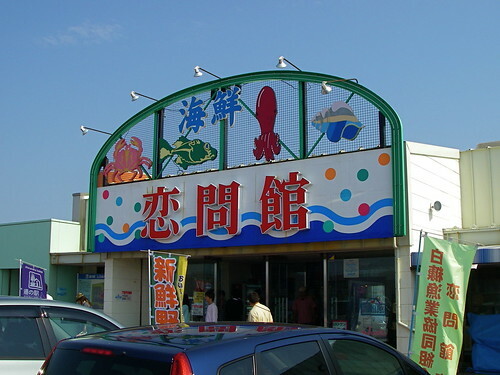 We then stopped at a roadside seafood market that also happened to have soft-serve ice cream, and I had my last Hokkaido ice cream of the trip on the beach. 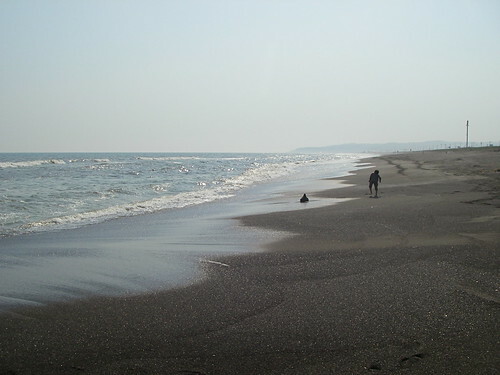 It was early evening by now and freezing cold, but ice cream on the beach is nice any time so I didn't mind. 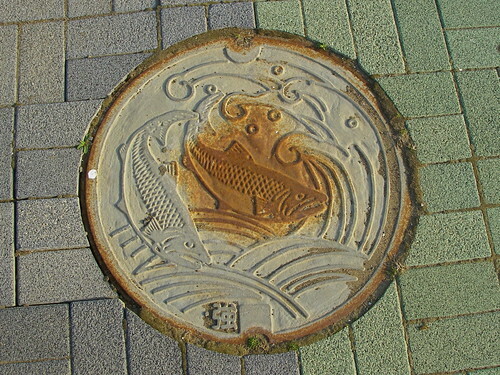 One last stop was at a fishing pier in Kushiro, featuring yet another salmon-themed manhole cover. 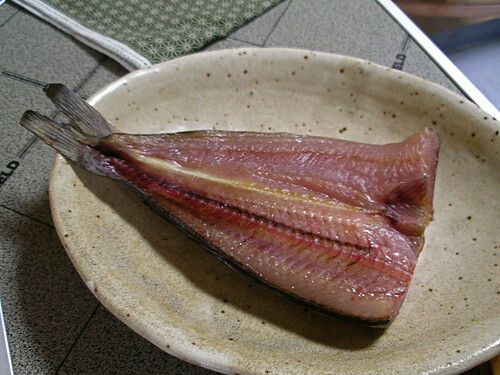 Back at my brother-in-law's house I had a quick dinner (they would do their real eating--and more importantly drinking--after I left), starting with sake-steamed clams and then moving on the tail-end of the hokke we'd had a few nights before. It was grilled at the table, as was most of the food we'd eaten on the trip. 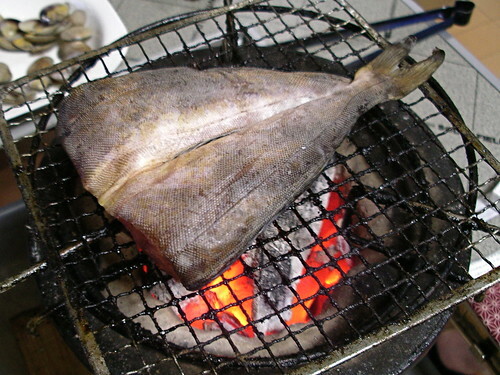 I haven't really explained the grilling, so now is a good time: for nearly every night of the year my brother-in-law grills his dinner with charcoal, either on the camp-style hibachi shown in previous posts or the shichirin grill shown above. 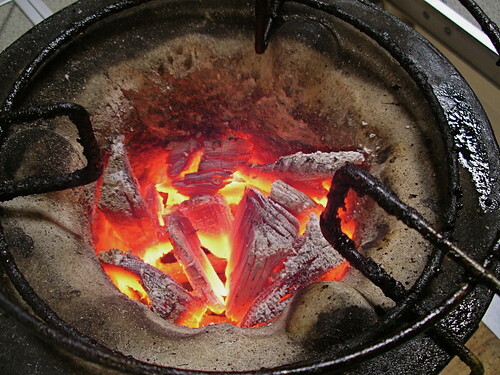 He uses top-quality charcoal and fires it up in the stairwell, and when it's ready brings it inside (being careful to keep the fan on and windows open). He has a camping table with a sunken middle set up in his dining room, and the grill is placed in the middle and the food is slowly grilled, while the alcohol and conversation flows. It is slow food in the extreme, and the meals we had there were all four or five hours long. It's a very nice, civilized way to eat, and although I wouldn't want to do that every day (nor would I have the time), it's great to see people doing this. 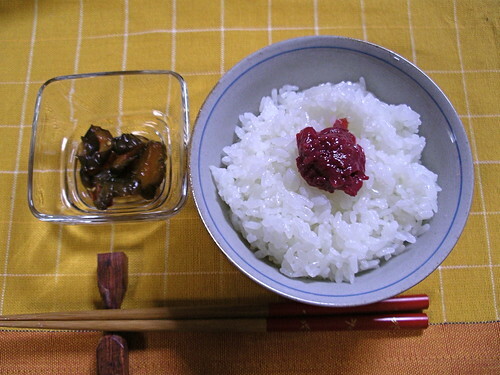 With a bowl of rice topped with umeboshi (salted plum) and pickles, the meal ended and it was time to go. I flew back to Tokyo with a very full tummy feeling tired but satisfied (Hideaki stayed on for a few more days). I'd had a busy four days, filled with stuff that a regular tourist would never get to experience. Thanks for the wonderful trip, brother-in-law! More pictures of the trip can be seen here. Not to mention the lamb!! (I actually have a leg in my freezer that needs roasting in the not-so-distant future, so that's okay). 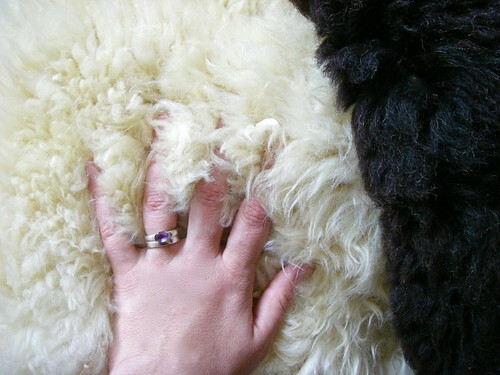 The sheepskin rugs are fantastic too; I used to have one as a baby/small child, as do most kids in Australia. yummy and you got to try the kattedon! what a great adventure! 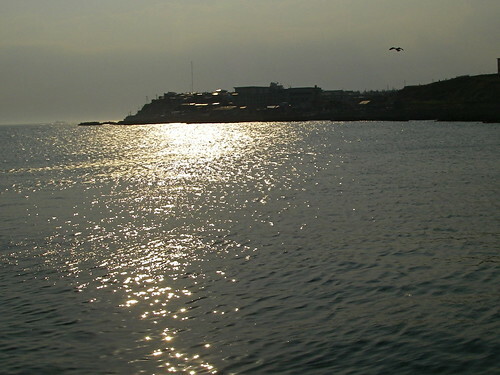 Kattedon sounds amazing - is it a Hokkaido only thing or can you get it anywhere else? Wow! That is one seriously amazing adventure and blog post! Bear meat - how interesting; unappetizing packaging indeed. The other food looks delicious though... all that fresh fish! 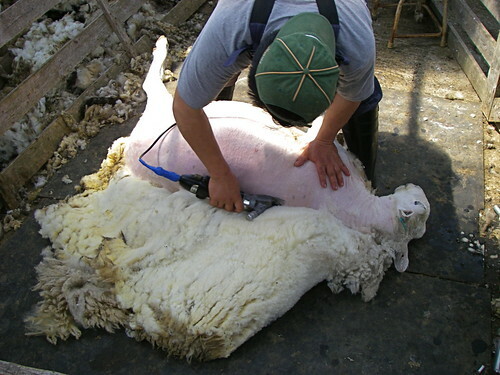 I really enjoyed the photos of the sheep shearing. 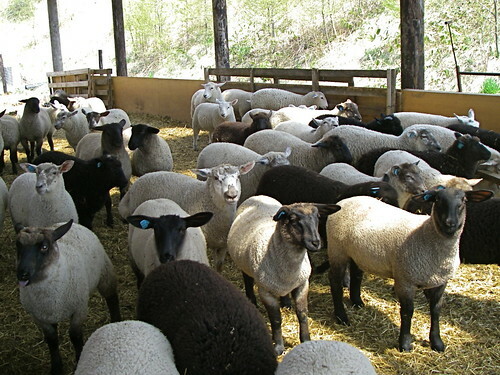 I grew up in Iowa (USA), and it brought back memories of taking a school field trip to a farm to witness a shearing. The sheep looking at her own coat is the best! I love that you went from seafood, to wool, back to seafood, lol! The seafood looked really delicious - I'd love to try scallops one day. The ones in the trays looked really plump and fresh. Sorry, I missed that or maybe it was a typo. Did you say that your brother-in-law cooks on a charcoal grill every night? Wow! I guess it's a style of robata - and I wouldn't pass it up if my dinner looked like that every time. 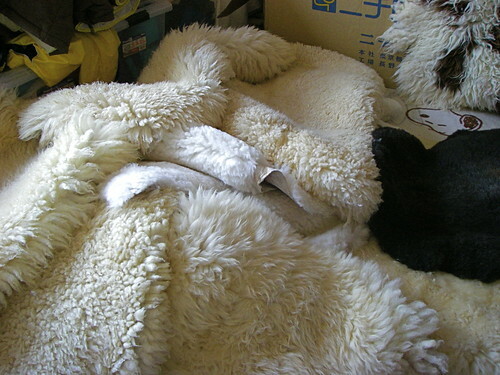 My in-laws have a sheepskin at their place, but I always figured it was fake. It's nice and comfy too, but it also picks up a lot of gomi. Sounds like you had a great trip! What an amazing adventure! 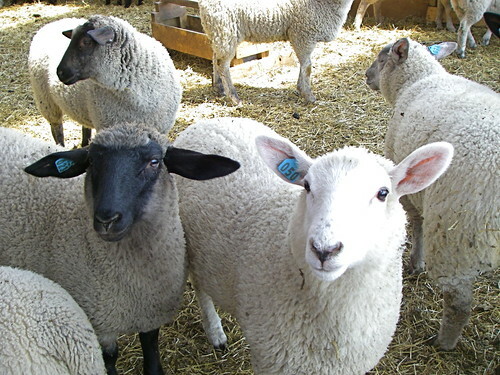 The sea food looks delicious and I read the part about the ewe getting a haircut whit lots of interest. Great post and great pictures!! I think you own a really brilliant blog. I have always expressed interest in Japan and am looking forward to migrating there after my studies. You've raised my already-passionate love of Japan. Thank you. That seafood is making me drool! I love getting fresh fish at markets and eating it right there- reminds me of Pike Place in Seattle. 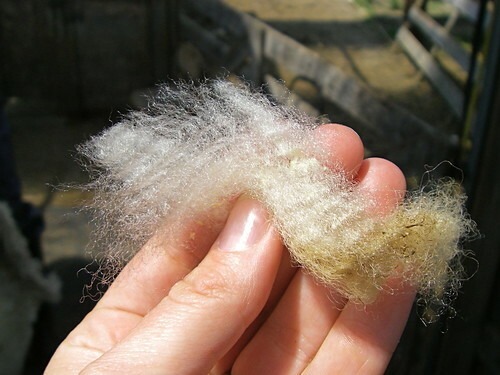 Cool photos of the whole wool-making process, too. What a beautiful cat Toki is! Is she a dilute calico? Me :"hey, I think that one wallaby might have a baby in it's pouch! See, it looks as though something is poking out!" Miranda: "uh, Mom, I think that's its testicles"